Pope Benedict XVI charmed the crowd by donning a broad-brimmed Mexican sombrero that he wore on his way to the altar for Sunday's mass at Bicentennial Park near Silao, Mexico. 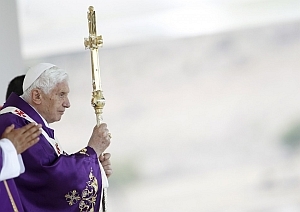 Silao, Mexico - Pope Benedict XVI has urged Mexicans to wield their faith against evils such as drug violence before hundreds of thousands of worshipers, saying they would find hope if they purify their hearts. Pope Benedict delivered the message during an open-air mass in the shadow of the Christ the King monument, one of the most important symbols of Mexican Christianity, which recalls the 1920s Roman Catholic uprising against the anti-clerical laws that forbade public worship services such as the one the Pontiff celebrated. The pope flew over the monument in a Mexican military Superpuma helicopter en route to the mass at Bicentennial Park. He rode in the popemobile to the service through an enthusiastic crowd that was expected to reach 350,000. Often seen as austere and reserved, Pope Benedict charmed the crowd by donning a broad-brimmed Mexican sombrero that he wore on his way to the altar at the sun-drenched park. Before the ceremony, the vast field was filled with noise, as people took pictures with their cell phones and passed around food. But as the mass started, all fell silent, some dropping to their knees in the dirt and gazing at the altar or giant video screens. In his homily, Pope Benedict encouraged Mexicans to purify their hearts to confront the sufferings, difficulties, and evils of daily life. It has been a common theme in his first visit to Mexico as pope. On Saturday, he urged the young to be messengers of peace in a country that has witnessed so much violence in a drug war that has escalated during a government offensive against cartels. "At this time when so many families are separated or forced to emigrate; when so many are suffering due to poverty, domestic violence, drug trafficking, the crisis of values, and increased crime, we come to Mary in search of consolation, strength, and hope," Pope Benedict said in a prayer at the end of mass. "She is the mother of the true God, who invites us to stay with faith and charity beneath her mantle, so as to overcome in this way all evil and to establish a more just and fraternal society." The reference to Mary is particularly important for Mexicans, who revere the Virgin of Guadalupe as their patron saint. His reference to immigration resonated in Gunanajuato, which is one of the top three Mexican states that sends migrant workers north. "People leave for the good of their families," said Jose Porfirio Garcia Martinez, 56, an indigenous farmworker who came to the mass with 35 others from Puebla. "For us it's difficult, not seeing them for 10 years, communicating by phone and by internet." Pope Benedict had wanted to come to Guanajuato because it was one of the parts of Mexico that Pope John Paul II had never visited during his five trips as pope. In addition, the Pope wanted to see and bless the Christ the King statue. With its outstretched arms, the 72-foot bronze monument of Christ "expresses an identity of the Mexican people that contains a whole history in relation to the testimony of faith and those who fought for religious freedom at the time", said Monsignor Victor Rene Rodriguez, secretary general of the Mexican bishops conference. After nightfall on Sunday, the pope remotely inaugurated its new lighting system. Guanajuato state was the site of some of the key battles of the Cristero War, so-called because its protagonists said they were fighting for Christ the King. Historians say about 90,000 people died before peace was restored. The region remains Mexico's most conservatively Catholic. With roads closed, pilgrims walked for miles to the mass with plastic lawn chairs, water and backpacks. Some wrapped themselves in blankets or beach towel-sized Vatican flags, trekking past vendors selling sun hats, flags, potato chips, and bottles of juice. Hundreds of young priests in white and black cassocks, waiting to pass through the metal detectors, shouted "Christ Lives!" and "Long Live Christ the King!" the battle cry of the Cristeros. Many Mexicans said they were surprised by the warmth of Pope Benedict, whose image is more reserved and academic than his popular predecessor, John Paul II, who was dubbed "Mexico's pope". But by Sunday morning, that seemed to have changed completely. "Some young people rejected the pope, saying he has an angry face. But now they see him like a grandfather," said Cristian Roberto Cerda Reynoso, 17, a seminarian from Leon. "I see the youth filled with excitement and enthusiasm."